Robert King is a successful, respected war photographer with images featured on a string of international and US front pages, but if you were to rewind 15 years you’d be forgiven for thinking that Robert King is a kid way out of his depth, in a place he doesn’t belong and much more likely to catch a bullet than he is to lay hands on the Pulitzer Prize he covets so dearly. Richard Parry’s documentary Shooting Robert King spans a 15 year period with King, in which we see his transformation from naive, reckless rookie in Sarajevo – he’s unable to name the various political factions’ leaders, dropped from his agency due to out of focus, generic shots and even wears the wrong trousers – to hardened, cynical war veteran – “How many dead bodies have I stepped over?” – lamenting his managed status as an embedded journalist with the US military in Iraq. 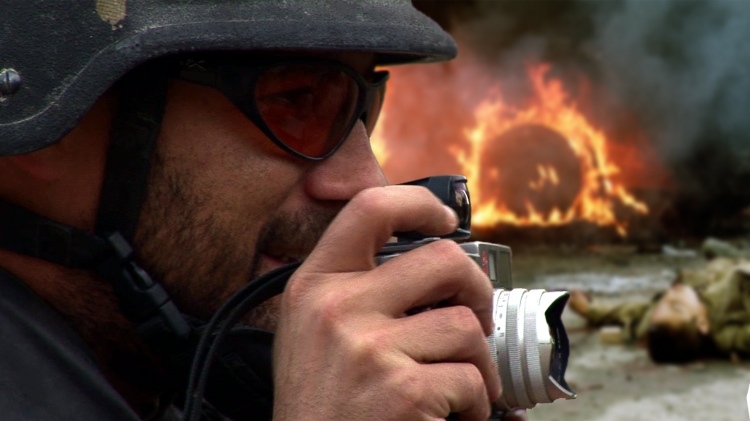 As well as presenting a personal portrait of an individual willing to risk life and limb to capture images many people ‘back home’ have little interest in seeing, the film raises questions of objectivity and personal responsibility as an outsider working in war zones. Parry has stated that the intention of the documentary was to get away from the romanticised view of the journalist as hero, and instead depict the reality of the slightly cynical, funny, impoverished individuals trying to make a buck in a profession that could very well kill them. It’s interesting to see how King moves through three distinct phases; the early naive days, the drink and drug fueled cynical days and finally his redemptive phase as a husband and father who has to learn to leave the war zones behind him when he returns from assignment. We don’t get to see how he slips from one phase to another, but the cross cutting between the various periods in King’s life highlights his development, both as an individual and as a journalist. There may not be a clear cut explanation as to why King (or anyone else for that matter) would continuously run towards danger, his own wife is puzzled by his compulsion, but there is acknowledgment that it doesn’t stem from a healthy disposition. When asked if he believes most journalists to be damaged goods King replies, “All of them. If they weren’t when they went in they are when they get out!” which is of course a perfect summation of his story. The DVD release of Shooting of Robert King includes three deleted scenes, the trailer, stills gallery, an audio commentary from director Richard Parry and producer Vaughan Smith and several featurettes: Making of Shooting Robert King, Riding Shotgun with the King, The Story of Frontline News, Director’s War Story, Un Corruption Story and The Frontline Club. Shooting Robert King is released on DVD today.